Princeton University Press, 9780691157610, 248pp. Sustainability is a global imperative and a scientific challenge like no other. This concise guide provides students and practitioners with a strategic framework for linking knowledge with action in the pursuit of sustainable development, and serves as an invaluable companion to more narrowly focused courses dealing with sustainability in particular sectors such as energy, food, water, and housing, or in particular regions of the world. 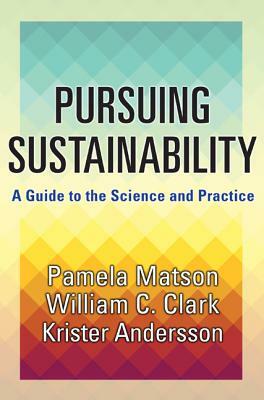 Written by leading experts, Pursuing Sustainability shows how more inclusive and interdisciplinary approaches and systems perspectives can help you achieve your sustainability objectives. It stresses the need for understanding how capital assets are linked to sustainability goals through the complex adaptive dynamics of social-environmental systems, how committed people can use governance processes to alter those dynamics, and how successful interventions can be shaped through collaborations among researchers and practitioners on the ground. The ideal textbook for undergraduate and graduate students and an invaluable resource for anyone working in this fast-growing field, Pursuing Sustainability also features case studies, a glossary, and suggestions for further reading. Pamela Matson is dean of the School of Earth, Energy & Environmental Sciences and the Goldman Professor of Environmental Studies at Stanford University. William C. Clark is the Harvey Brooks Professor of International Science, Public Policy, and Human Development at Harvard University's Kennedy School of Government. Krister Andersson is professor of political science at the University of Colorado at Boulder.